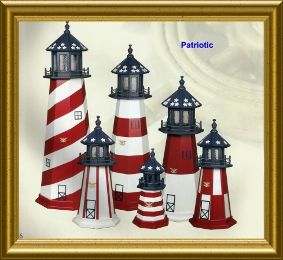 Long Island, New York is the home of Eighteen Lighthouses, Montauk being our most famous. It was a natural choice to add them to our product list. 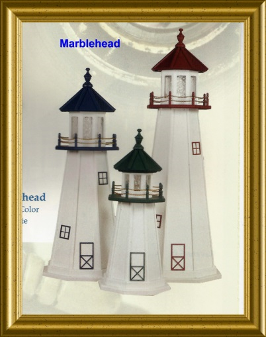 Handcrafted by the Amish in the Lancaster Area the workmanship is impeccable. We have been dealing with the same family for ten years. 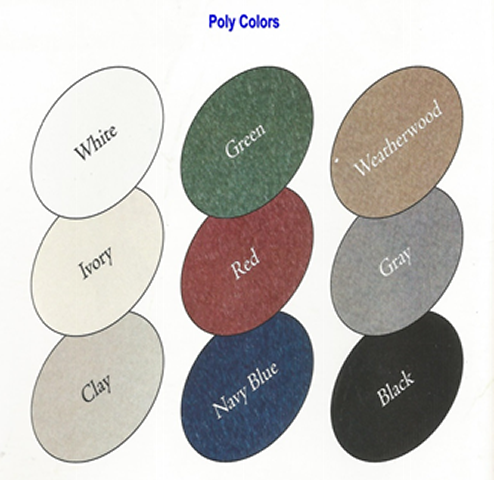 The materials are such that the houses will be a long term addition to your yard. Made of top quality signboard plywood and painted with exterior paint. They are built to endure all types of weather conditions. This is a maintenance free product. Will not rot, chip, fade or splinter. The styles are more limited. 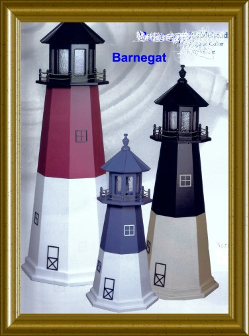 Barnegat, Cape Henry, Marble Head, Cape Cod, Cape May and Split Rock. But they are beautiful. 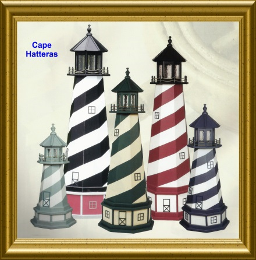 All three types of lighthouses have two more options: Lighting and Base. 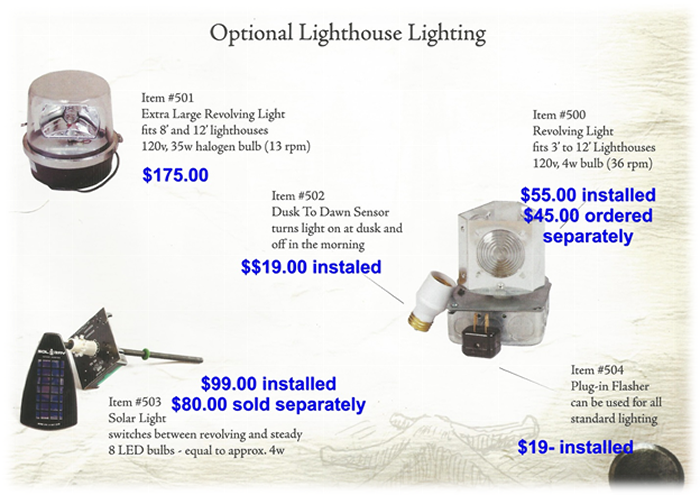 They come standard with an 110V powered 25wt light (STANDARD SIZE). Add a 110V powered Revolving Light for a more realistic effect. • Solar revolving lights when there is no power nearby are also options. • Dusk to dawn and plug in flashers are also available. 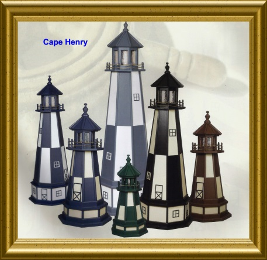 All of our Lighthouses (2', 3', 4', 5', and 6') can be enhanced with an optional Base. 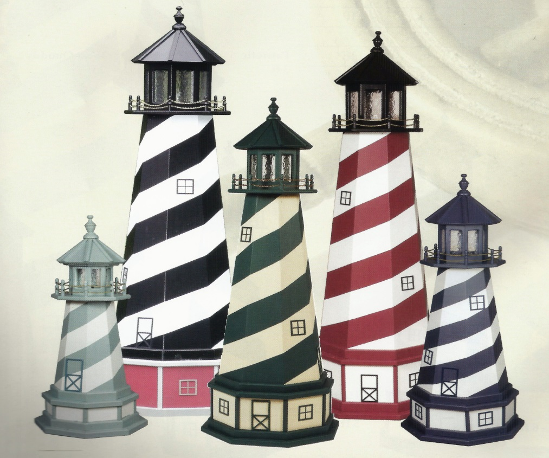 Our Lighthouses can be built to match your color choices or any existing lighthouse in the US. 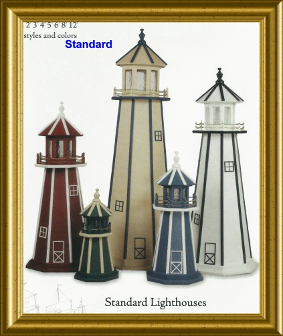 Contact us for further information regarding lighthouse choices other than illustrated. 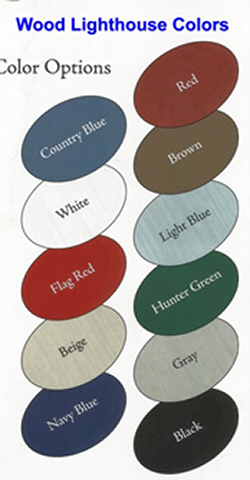 Red, Flag Red,Green, Clay, Grey, Brown, Beige, White, Black, Country Blue, Lt. Blue, Navy. 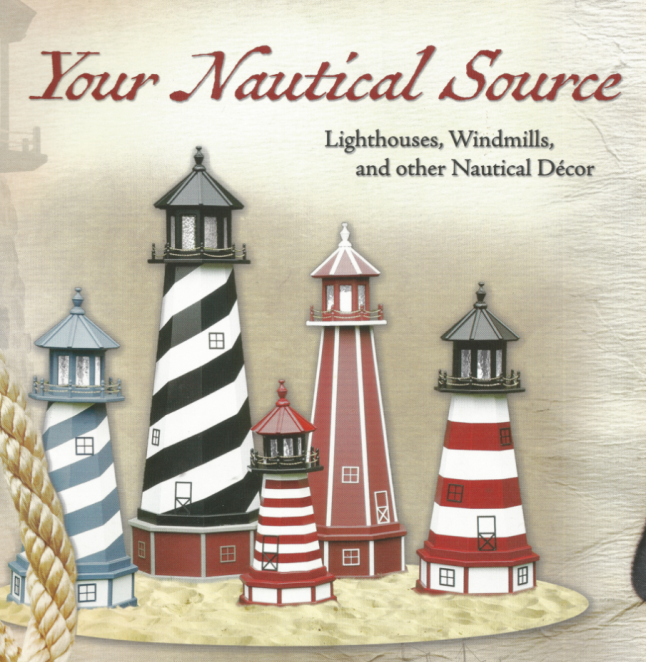 Contact us for more information about our decorative windmills, lighthouses, and more.